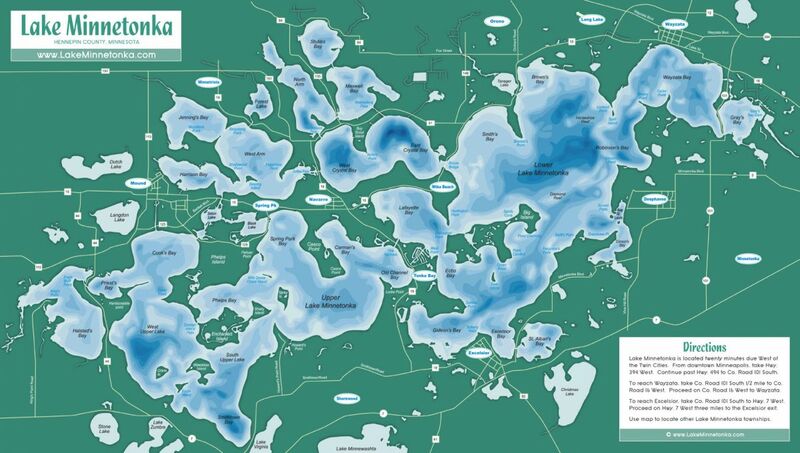 ISLANDS: The number of islands in Lake Minnetonka varies according to the different definitions of islands. The 1993-revised U.S. Geological Survey topographic maps lists 38 islands. The 1944 Hudson’s Indexed Map of Lake Minnetonka and a 1964 map made by the Hennepin County Highway department lists 23 islands. Dredging and filling of the lake’s original features has created, connected and obliterated islands. STATISTICS: The lake is made up of a number of a series of bays, points and islands with 31 interconnecting channels covering 22.2 square miles of water (14,043 acres) and 125 miles of main lake shoreline not counting islands and channels. The drainage extends over 123 square miles; the deepest point is Crystal Bay (101 feet).